Re:amaze is a helpdesk and customer messaging platform designed from the ground up for modern web based businesses. Re:amaze can be fully integrated and embedded into websites or apps for rich, seamless customer conversation management via email, live chat, social media, SMS, and voice applications. Re:amaze also comes with marketing automation built in so marketers and support personnel can collaborate and convert more customers. "Careful interface to facilitate better support"
The chat that the system has is very intuitive and allows not only to maintain a fluid communication with the client, but also to review everything that has been said previously, the communication history. Being able to access and review all the conversations allows for fewer doubts and for the interaction to be more fluid. It has multiple integrations with other applications that helps to better manage sales, advertising and also to have a database with a greater amount of information, which allows having a unified knowledge. The support of Re: Amaze has helped me to solve doubts and all the consultations that I have done on functional aspects of the program have been able to solve them. There are some problems when you want to send certain documentation by chat to the clients, since there are some formats that are not accepted for sending through this system. But when something related to this has happened to me, the support has been able to tell me what format I should use and what problem there was. It is a good help desk software that can help a company to better serve customers and improve the conversion rate. We have the possibility of giving a much more complete solution than we could offer before. Our customers are happier with our support, because when they have any questions about a sale, a product or even about general problems, we immediately contact them through chat or use the ticket support and with these tools we are able to give better attention . Information on sales made and contacts with suppliers or customers are recorded within the system and this helps us to gather more information and to improve our profitability. "Help-Desk with a good system of tickets and notifications"
An addition that seems important to me is the system of notes. Through this system you can leave information that you want another company worker to read when you log in within the system. It is a good way to leave notices so that you can see them just connect to the platform and answer the question quickly. The ticket system is simple to use and also helps to solve any doubt efficiently. There are even notifications via mobile, which allows you to respond faster to any topic. The integrated chat is somewhat slow and sometimes has connection problems, it is an aspect that could be improved in future versions to be more stable, because even if it works properly, if these small defects were solved the communication made would be even more dynamic through this system. To have a well-functioning Help Desk inside a company is essential to assist your clients in the best way possible. Re: amaze integrates within your system a system of tickets, notifications and sales analysis that serves to better serve your current and future customers, so I think it is a good addition. With Re: amaze we have gotten our clients to have a better communication with us, since now we have more channels to talk with them and to be able to solve any doubts they may have. We have within our company a section of questions that are usually very demanded by customers and with this software we have been able to create this list to solve many questions instantly. We also manage the orders more completely, since we can see the details of the sales, the communication made with the clients, the modifications or changes of the orders ... It is easier to see a sale in an integral way, which helps us to improve also our sales system. "Closer and more complete communication with your customers"
The improvement of the communication and the facility to interact with the clients is something that would stand out positively of this software, since it helps you that it is much simpler to solve any indicidence. It's easy to connect your store and products with Re: Amaze. With a few clicks you already have the linked shop and all the necessary details integrated within the platform. The templates that this software has also help you to automate with them certain answers to common queries. This allows a saving of time and also a much faster response to customers who have general inquiries about our platform. You could add a greater possibility to edit the labels with colors to highlight or differentiate the different messages of the platform more easily and clearly. Everything is integrated centrally within the software, which implies that there is a lower layer of flexibility. This is not bad, but you have to know what you want to do and integrate before putting it into operation to give it the right use based on your needs. Re: amaze is a good option for small and medium companies that need to increase the capacity to give a better response and attention to the users of a company and also create optimized marketing campaigns. We have used it to design and plan promotional campaigns for certain products and it has worked very well for us, we have obtained good results in our sales managing these products from this software. Customer service has also improved, since we can now provide better service to our users, both through quick and automatic responses to certain general problems and personalized responses to more complex problems. "Re:amaze - Set of tools, for a help desk." The live chat, is one of the features that I like most about this application, it is a chat where I can see all the history that I have had with the clients, this system is very versatile, and allows me to solve the support cases in minor Time, having predetermined questions and answers, helps me attend to different users at the same time, which minimizes my work times, and gives me more freedom in my work, synchronization with social platforms, it is admirable, it is compatible with all, you can do a synchronization of information with them, to obtain a better information of the clients, it is impeccable support system. Certain types of files, are not compatible, with chat, and cannot be sent directly, which must be modified to another format, or sent by other means, even though they have been few, in the time that I have been using this application. , there have been some cuts on the server, although they have been a few minutes, it is something that must be taken into account, which can happen. A tool that meets all the needs that a help desk may need, recommended for all types of businesses, that require a complete support solution, in the same system. Thanks to this tool, a full support service can be provided, with all the necessary tools, which requires a help desk, to provide online solutions, complete to our clients, the inclusion of all types of support services in the same tool, reduces labor and infrastructure costs, in addition the work and response times of employees, greatly improve, to be able to perform all support tasks from the same place. Re:amaze takes at least 1-2 minutes out of every CS query that involves a recent order (which is 80% of them for us) since the customer details and orders are all pulled from Shopify and displayed right next to the message thread. It has also simplified our FAQ section and the way customers can get in touch with us from any page of our website. Very few complaints... the platform itself can get a bit memory-intensive in the browser, and the response templates are still not as simple to use as I would like (got spoiled with Gmail canned responses, where you just set an abbreviation for a certain response - if Re:amaze had that instead of their drop-down templates menu, I'd love it). Absolutely give it a try - especially if your business is Shopify-based. As a startup selling our physical products on Shopify, optimizing our time use is crucial, and Re:amaze absolutely delivers there. Customer support is a lot simpler to manage, having everything in one place, linked to actual orders - a far cry from when emails were dropping into one inbox, FB messages into another, and website messages sometimes went directly to spam. Being able to organize all our Help/FAQ articles - and then link to them when someone asks - is an absolute plus, too, and the rate of repetitive questions has definitely gone down since we've enabled to chat widget with direct links to our Help section. "very useful for daily support tasks"
I like that Reamaze is very easy to use, possible to leave internal notes for other support members. I like that it is possible to use multiple brands at the same support interface. Possibility to add knowledge base - it is very useful when new support member comes to the team and needs to find the info very quickly. Mobile notifications - very useful if you are running small support team but would like to have support running 24/7. how interface displas resolved / unresolved tickets. application integration - very easy to integrate with well known brands, you should add more integration to this list. From time to time, there are problems with reply binding together with tickets and customers reply shows up as a new ticket, not as a reply to the previous one. Also, we have noticed that sometimes there are some problems to receive tickets from partners who are using Zendesk as their support system.interface could work a bit faster. There is no possibility to enter billing details like - what number, company name, company address, registration number e.t.c. to appear in the invoice. Very easy to implement, you can start using it within minutes. Reamaze providing smooth support work. We are working daily on more than 150 support problems. Reamaze lets us solve them all and not forget any of the support cases. Also, Reamaze allows work multiple support members to works at the same support ticket and avoid multiple replies to same support case. Re:amaze is amazing. It keeps me up-to-date as to what people are saying.I can reply promptly and without spending a lot of time online. It has made my business more efficient and has brought business in due to a fast response while people are in the buying mood. I think features that I would like to see are an option to either respond via email as I do now- or go directly to the site where the comments are originating from. Maybe you have that but I cannot afford to pay more for an enhanced service. Please give this wonderful product a chance! It has eased and lessened the demands of keeping up with my website and social media conversations and it is very streamlined and easy to use. My IT man installed it and then it started working to great effect. I really appreciate not having to log in to see conversations, comments and questions regarding my business. It is a real time saver for me as a small business owner. Instant response= more purchases. I am a small business owner and this helps me to be responsive.I would like other staff members to be able to respond too. Hi Pamela! Thanks for taking the time to review Re:amaze. I'm David, one of the co-founders here. Efficiency is what we're after and we'll continue to keep that as a top priority as we grow. In more specificity, I would like to address your dislikes because that is core. You can currently respond via email to conversations from all channels such as email, social, real time messaging, and sms. All you need to turn on is email notifications and when you receive a notification, simply hit reply :) To go to the site where the comments are originating from, simply scroll to the top where it'll sometimes say "via wall post" and click on the "wall post" part. This is included with every account and not something you need to pay extra for. We wouldn't do that! Thank you for being a loyal Re:amaze customers. We truly appreciate it. "Great value and tool for the money - easy to use and very helpful!" The depth of the entire product suite for the price. You have the ability to completely customize your chatbot and even create flows to improve your conversion rate. For a while (until I got into trouble with my suppliers), I was able to offer an abandoned cart coupon as a pop-up. I also love how everything is integrated across channels>>Shopify, fb messenger, ig (though I can't really seem to reply to comments from within reamaze easily) and even email. It's also very intuitive and thorough. I think there's a lot of capability that I'm not even using. My suppliers not allowing me to take advantage of the awesome abandoned cart coupon sequence. I think it would have really benefited me and my business. take the time to do the tutorials and learn it immediately. There's so much functionality there. Sometimes I feel like I'm merely scratching the surface. Being able to be accessible to my customer's questions in a timely manner no matter how/where they reach out to me in order to earn their business or help with their issues. It's a much more powerful tool than what I had used before -- Tidio. Hi Joanna! Thanks for taking the time to review Re:amaze. I'm David, one of the co-founders here. I'm glad we're offering value to your business and to make your communications more fluid. In terms of offering an abandonment cart coupon, I would recommend using our Cues feature, which is included for free with every paid Re:amaze account. It allows you to setup trigger events for when someone exits your website or cart (provided that you have Shopify Plus in order to add custom snippets). The Cue will send customers a message which can include a pre-created coupon code. You can also modify the Cue rules to target only specific Shopify customers that have made, for example, over $300 in purchases. If you need help with this please feel free to reach out to our support team for help. We can point you in the right direction. "The absolute BEST Help-Desk Platform for Shopify & more!" Reamaze helps bring down customer service costs while providing great customer self-service and a great experience for both the customer and customer service rep. I'm also in love with Reamaze's support team. They're incredibly helpful and willing to listen to our issues, questions, and feedback. It's increasingly difficult to find businesses like this nowadays. The classic live chat could be improved. Sometimes it's slow and acts up. Great software to go with, this is a company that will be around for years to come. The customer support is extremely helpful, and they really do care about all of their customers. Reamaze solves basically all of my help desk needs. It's easy for all of our customer service reps to work together on solving tickets. When dealing with one of your past customers through live chat or from a simple contact you form, you get a detailed look into their past conversations with you, how long they've been a customer, what they purchased, how much they've spent with you, order details, shipping details and much much more. All of this information you have right in front of you while interacting with your customers either live or not. Hi Josh! Thanks for taking the time to review Re:amaze. I'm David, one of the co-founders here. We're super stoked to hear we're helping you manage costs and offering great support. It's what our team is trained to do. Classic Live Chat is definitely something we aim to improve in the near future. As it currently stands, classic live chat is somewhat less popular than real time messaging. It's also important for us to offer an even better core chat experience before moving some of those advantages over to classic live chat. These are not excuses though so we'll definitely take your feedback to heart and make classic live chat better. As for speed and the dashboard acting up, our developers would love to know more because I know I would. Can you message us through your dashboard about this so we can help diagnose things? I would check to see if you have an adblocker of some sort, maybe clearing your cache and cookies if you haven't done so in a while. Also let us know your location to rule out any network packet losses, etc. Again, thanks for being a loyal Re:amaze customer. We're 200% appreciative. I do wish you could search by email content as well-- For instance, if we have a return processing for an order say 45678, I can't just type in 45678 in the search bar and have it pop up, unless it's in the title. But that is an easy fix, as I just edit the title which you can do so easily. Utilize your organization from the get go, don't wait until a problem arises and then you have to go back and tag everything manually. Implement your tags and work flows immediately and have a clear plan for all of your employees. I am able to see every word that comes in from every customer, so I can make sure that I don't miss a thing. We can also add tags for data collection, which is amazing in figuring out common denominators in random issues. Thanks for taking the time to review Re:amaze. I'm David, one of the co-founders here. When we first started out to build Re:amaze back in 2012, social media was top of mind and not everyone was offering this. I'm glad it's paying off! In the future, we hope to make Re:amaze even more multi-channel focused. Searching by email content is definitely supported and I'm sorry to hear that you're having trouble with this. If the order number 45678 is in the email body, our search should be able to find it. In fact, I just doubled checked this to keep myself honest and I was indeed able to locate a conversation based on the content of the body. Please message us through your Re:amaze dashboard and we can help look into your particular cases. Thanks again for your time and we appreciate your support. 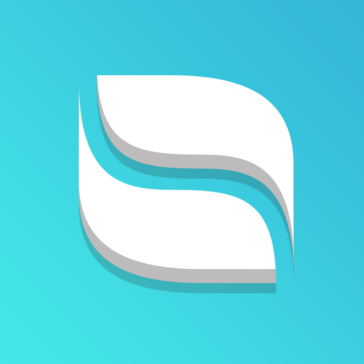 I absolutely love this app and it is worth the cost per month. It works SO WELL and gives our site such a professional feel. I have had a lot of clients reach out through it and because they get my personal attention, they have become very loyal customers. I REALLY love that there is an app so I can reply anywhere that I am located. Nothing so far! There is a LOT that I am still learning about this app and I feel like it will take a while to get there. But I originally got it for the customizable live chat and being able to reply from anywhere. It might be nice to have a scaled down version for people like me who have a very small business and are really just looking for the live customer service features. I would totally have gone with that! We are able to answer questions our clients have WHILE they shop and it helps us close the sale. It also is a lot easier than emailing back and forth, since we don't do anything via phone. It also creates such a personal point of contact and it creates very loyal clients. Once I get my husband using it too, it will really help to have the multi user feature, so the clients know they are talking with him and not me. Hi Alexis, I'm Marvin and head up the customer experience team here. It's great to hear you're enjoying Re:amaze! I'm even more excited to hear we're helping make a positive impact on your business's branding. There's definitely a lot to learn in Re:amaze and the other reviews here echo that sentiment. Personally, I think there's room for improvement in making our app easier to learn so we'll get started in that area. If you haven't already checked out our YouTube channel for my videos or our FAQ, I highly encourage it. "Re:amaze as knowledge database & first point of customer contact"
I really like the live activity feed of the customers on our homepage. That way I know exactly what products they are watching without having to ask them in the chat. It helps me helping our customers faster and more reliable. The knowledge database integrates well with out website and is easy to use. Wether you prefer live chat or messaging, work with different brands and colleagues - Re:amaze is self explanatory and easy to use. Sometimes the live feed traffic for our homepage seems to be stuck, it shows people in the webshop that have already left hours after they are gone. Also when answering messages by email the message feed gets a little confusing due to email signatures. "Shaved 8 company hours a day using Re:Amaze"
The ability for our CSRs to reply quickly and efficiently to our customers, while being able to track our entire operation seamlessly. We have had a few problems not being able to separate an email thread into two, its a very minor problem. Any other problems we have had have been solved or developed by reamaze to make it work! Its easy and so affordable, you ll never find a system like this for the cost. I have tried expensive ones and they are terrible. We got rid of Outlook as a customer service platform. We now only use Re:Amaze and it is unbelieveable. Our test with 6-8 CSRs by day one they had saved 1-2 hours each per day. We now have 32 reps using it and saving about the same amount of time each day. Hi Brad! It's great to see your name pop up here. Thanks so much for taking time out of your day to write something awesome. You're right, we don't currently support splitting emails into multiple threads. We do however support merging. I'll speak to the team about whether or not this is possible. Email is a complex beast and definitely complex to tame but we'll certainly look into it. I'm adding this feedback into our tracker! "THE BEST tool for eCommerce customer support"
Re:amaze changed our business and customer support for the better. Re:amaze has very deep integrations with our ecommerce platform (Shopify) and all the channels we use to communicate with our customers, including social media, email, and live chat. This creates a single all-in-one view of a customers entire relationship with us enable us to really personalize our support. Also, the highly customizable brand experience in every aspect of Re:amaze from the colors to the default text and the icons is really nice. The workflows could be a little easier to use - but to be fair they are constantly improving them. In general there is very little to dislike. There isn't a better all-in-one ecommerce customer support platform. The price is excellent and their customer support team are incredibly responsive and helpful. Re:amaze streamlines and speeds up customer support for ecommerce companies. It pulls in all possible support channels, including social media channels, into one complete view of a customers messaging and order history - meaning my support team doesn't have to switch between platforms. It also reduces workload on the support team with highly customizable support workflows, taking a lot of mundane repetitive tasks off their plate. Hi Antony! Marvin here from the customer experience team. Thanks for taking the time to write a review. Happy to hear you like the Shopify integration so far. There's more coming for Shopify so I hope you'll stay tuned for that. We have something on the roadmap to revamp and improve workflows. I couldn't agree more that we can make it easier to use with more straightforward syntax and terminology. Jotting this down! Was ich an Reamaze mag, ist, dass es viele Funktionen und verschiedene Möglichkeiten hat, mit Ihren Kunden zu kommunizieren. Zum Beispiel gibt es Live-Chat, Social Media und SMS. Ich denke, dass das heutzutage nicht mehr in dieser Art von Software zu sehen ist. Der Support-Service von Reamaze ist immer so hilfreich und freundlich und sie antworten uns immer, wenn wir nicht wissen, wie man etwas benutzt. Die Ästhetik und das Design der Software ist unglaublich, mit der Farbe Blau umgesetzt, es ist so leicht zu konzentrieren und nie verloren gehen. Ich mag es auch, dass diese Software in Slack und Github integriert ist, eine Software, die wir auch in unserem Unternehmen verwenden. Reamaze macht es einfach zu verstehen, was unsere Kunden sagen müssen und hilft uns, alle Zweifel zu lösen. Das einzige, was ich an Reamaze nicht mag, ist der Mangel an Übersetzern. Als eine deutsche Person denke ich, dass dies für andere Mitarbeiter hilfreich wäre, aber es ist kein großes Problem für mich, da ich Englisch spreche. Reamaze wird Ihnen nicht nur helfen zu verstehen, was Ihre Kunden über Ihr Unternehmen sagen, sondern es wird Ihren Kunden auch helfen, über verschiedene Wege wie SMS und Social Media zu sagen, was sie sagen müssen. Ich würde diese Software wirklich jedem Unternehmen empfehlen. In unserem Unternehmen sorgen wir uns wirklich darum, unseren Kunden das Beste zu bieten. Mit dieser Software können wir unseren Kunden Fragen stellen und Ratschläge geben. Seit wir Reamaze verwenden, finde ich, dass es uns besser geht, Kundengespräche zu führen. Hi Claire! David here from Re:amaze. Thank you for submitting a review for us. We appreciate it. Localization is definitely an area we want to focus more on. That said, it needs to be done 100% right or not done at all. Currently, we offer you guys a text customization tool because we believe you will be the best at translating customer-facing content and what works best for your customers. I'll take your feedback to the team and ensure we discuss localization in more detail. "Great for retaining and converting customers. Much more than a helpdesk." I really wanted to love intercom because it was the first product that went beyond helping customers. But honestly their product is not that impressive and quite expensive. Reamaze does exactly what intercom does (for what we need) and at a consistent price point. It has helpdesk. It has customer messaging. It has FAQs for customer education. Except it doesn't cost you an arm and a leg. Reamaze is an underdog. There still needs to be some fine polish around the edges but it doesn't fall short of industry standards by any means. The team is responsive to feedback and there are changes coming out all the time. It's not a huge dislike on my part. Definitely try these guys out and tell them your headaches. Their support is great. Always get a demo from them. We use Reamaze as a helpdesk for incoming customer questions. Our sales and marketing teams also use it to scale up customer outreach to bolster retention and conversion rates. Reamaze has features that does all of that and more. Great stuff. As I like to tell my team here, there's always room for refinement and polish. Fortunately, our team is more than capable of this so we'll be sure to improve everything. Pricing is something we're proud of because we believe it's important for businesses to keep track of their expenditures in a consistent way. In a marketplace now dominated by volume-based pricing, I think our way of charging folks is somewhat more friendly. The last thing we want is to punish you for growing. If there is a difference, we want to make it up with better customer support, better features, and better experiences. "A modern SaaS business willing to go the extra mile to help customers." I'm in love with Reamaze's support team. They're incredibly helpful, proactive, and willing to listen to our issues, questions, and feedback. It's increasingly difficult to find businesses like this nowadays. We will always hear back from them and they always follow up. Their product platform is outstanding, offering a wide range of features we need as a small healthcare facility. Reamaze is a robust platform and like a lot of powerful platforms with lots of features it get become unwieldy at times. This is why having great customer support is even more important. I'd like to see Reamaze get better at making their interface even more easy to use. That said, once you get used to things, it's still fairly easy to use and learn and team other team members. We're using Reamaze for customer support. Patient families will always reach out to us for a variety of reasons and we use the platform to correspond with them wherever we are. "Perfect platform for shared inbox, customer messaging, and customer education." Reamaze is best alternative to a platform like Intercom or Drift and is much more than Zendesk or Freshdesk. It's core features are helpdesk and live chat but there are features that will allow sales and marketing teams to flex their muscles along with customer service people all on the same app. Very powerful stuff. My favorite? The pricing of Reamaze is amazing. Intercom charges by number of customers which we have a lot of so it's very expensive. Reamaze is per agent based. The pasting of scripts is annoying at times but I totally understand why it's necessary. This is easily remedied if you install Google Tag Manager on your website or app to make publishing and unpublishing scripts easier. Scripts apply to live chat and proactive engagement stuff. We're using Reamaze for customer relationship management pertaining to customer service, customer messaging proactively, and also FAQ. We're basically using all their features! "The most modern helpdesk and live chat platform for a growing business. Great customer support too." Re:amaze is feature packed and incredibly user friendly. The team is very feedback driven so whatever you suggest can actually get implemented on time. Working with large software companies can be a real pain but Re:amaze is a medium sized company that really listens to its customers. I use Re:amaze live chat almost everyday but only the real time version. I don't particularly like the always-on enterprise live chat. It may work for some companies but I don't particularly like it. Make sure you sign up for a live demo of the entire platform. They also offer a training session for all their paid customers so take advantage of that as well. Re:amaze is helping us with customer support. Our sales people use it to monitor what our customers are doing. We also have it integrated with Upscope so we can co-browse with our customers easily. We realized we're probably not even utilizing all of its benefits but we're learning every day! "Switched from desk.com to re:amaze and not looking back"
We like the live chat and website integration. Creating articles for the FAQ is really easy and idiot-proof. Developer documentation is pretty comprehensive, and they are available to answer questions if you can't find the answers yourself. We cannot update our FAQ article titles as easily, because the title is mirrored in the URL. In some other help desk platforms, the article contains a numeric identifier that stays the same (even if the text-based title gets updated from time to time). That's going to make it more challenging for us to keep links updated. Definitely make use of free trial so you can test everything out for yourself. They make it really easy to preview changes and see what YOUR site will look like with their integrations! We were forced to find a new help desk provider after spending many years with desk.com (as Salesforce announced it was retiring Desk.com and tried to switch us to its much more expensive ServiceCloud platform). We know hundreds of other small businesses are in the same boat, scrambling to recreate their FAQ site quickly and efficiently. Re:amaze has answered all of our questions quickly, efficiently, and honestly. Honesty is important because, with any migration, there are little surprises along the way (like benefits you didn't realize you were getting, but also small disappointments when you discover missing features or changes that you weren't expecting). What matters is that they are honest with you up front and they try to help you understand what you will/won't get, BEFORE you make a huge investment of time and resources. I'd much rather work with a company like re:amaze because they're helpful about your initial migration questions, AND they continue to be available and helpful once you're an existing customer. Contrast this with other help desk providers where Sales (for new customers) and Support (for existing customers) are two totally different departments that don't even communicate with each other. Hi Kate! Great to see you leaving a review here. Our team loves working with your team too! I wanted to share a tid-bit about updating FAQ articles and their URL fragments. When you update an FAQ article and for some reason need to change the URL, you can open the article itself, scroll down until you see URL Fragment. This will allow you to change the URL fragment to anything you want (probably to match the title, etc). I hope that helps! Please continue sending us feedback like you always do. We appreciate the support. "Tried 2 others first, Re:amaze is the right one for our B2B SaaS"
It's the best fit for B2B client support. The knowledgebase can be seamlessly embedded and not published out to the public, so you can provide a deeper level of support & documentation without everyone knowing how the sausage gets made. It's also extremely well supported, constantly improving, and the support is stupendous. Would like to see view tracking on the articles so we know what's working. Customer profiles that contain better data, and group customers into companies would be fantastic. I'd like the ability to upload photos and videos for the articles instead of writing markup--it works, but it's a little more effort. A little more customization of the live chat widget might be nice. If you care about B2B support & documentation, how high-performing the chat widgets are, or having a personal support relationship, give Re:amaze serious consideration. We use Reamaze as our primary chat and documentation portal for our B2B client support. Back office users can search, learn, or chat with our support team to learn how best to use our platform. Our goal was to catch over 30% of questions live people would have to answer with our knowledgebase, and we've exceeded that. What's rather unique about Re:amaze is you can have an integrated, searchable, fully embeddable live chat and knowledgebase that isn't published publicly. That's ideal for us. Gives me a central location for emails that need to be responded to. They remain there until acted upon. Forwarding messages from a company email address that is not a subscribed user causes the message to import as the company email rather than the client email. I need the ability to split threads as clients often pick an old email to respond to when making a new request. I run a small custom fabrication company and clients write to us with requests. There is a lot of discussion back and forth before the job can move forward so it's important for us to see and respond quickly to new messages. I was marking messages back to unread if I hadn't acted on them yet, but with multiple people looking at them, they often got marked read and then overlooked. This solves that both by giving multiple people access without sharing a single inbox, but also tracking whether messages have been responded to yet. "Perfect fit for our remote customer service team"
integration with our shopify store and its customization abailities. Reamaze has the ability to match our brean very tightly. we needed a help desk solution that would allow deep integration with our website and that was accessible to our staff - all of whom are constantly travelling and/or remote/work from home. Reamaze fits the bill perfectly and offers all of the features we were looking for. In fact, MORE features than we were looking for! We've been on reamaze for I think 2 or 3 years now and can't imagine ever using any other platform. I love the simplicity of the mobile app. I can easily and quickly respond to my customer's support issues via the Reamaze mobile app regardless of my location. My customers have no idea I'm out of the office. It has helped us significantly improve our communication and response time to our customers. Unfortunately Re:amaze has not yet figured out how to automatically resolve support tickets for us. Joking aside, we have no complaints or dislikes about the product. Try it out for 30 days. It's well worth the cost. IT Support. I can provide a quick response to my customer's support issues regardless of my location. "Pretty good customer service system"
I don't like the search function--it's quirky and doesn't always find things easily. I also don't like the email view--I want to be able to see what the email looks like to the customer (showing history, replies, forwards, etc. ), as I'm always nervous of what's actually displaying (if we've had internal notes or forwards). I would also like to be able to insert a "P.S." below the signature line. Make quick and heavy use of tags as soon as you start using this program. You will have to rely on tags to find things until the search function is improved. Customer service...it has helped multiple people handle emails so nothing is lost when someone is out. I like the ease of use and that it allow us to have all of our methods of communication (email, sms, FB, chat, etc) in one place. Makes it easy for multiple staff members to divide the work. Would really like the "notes" section to be located to the side and not directly underneath the conversations. It's far too easy to mistakenly send an internal note meant only for staff to the customer as a reply. Also, would like the pop-up notifications to be larger and louder and have the option to not let them disappear without manual approval. You get what you pay for and this system is well worth it. Having everything in one place helps us keep our sanity. We love the "hybrid email-chat" function. Re:amaze helps us communicate with our customers easily and efficiently. "We have tried a number of systems for email management, however, Reamaze has been the best by far!! " I love the support, I love the innovation of the product over time. I like the flexibility of the system that allows the user to customize. I would love real time record of customer reviews. For example where in the time sequence of a conversation did customer satisfaction response come in. I would love it articles could be assigned to more than one brand. Try Reamaze. You will love it! We support our customers with reamaze, through help center, chat, and email. We like how you can consolidate all of your messaging with customers on all channels into one platform. We also like the FAQ Articles and the ability to embed them. Plus the chat bot is able to search FAQ to prevent unnecessary customer service contacts. We have had problems filtering Facebook messages that have already been answered by our Messenger bot. I would like to see tighter integration to channels like Amazon, eBay, Walmart, etc.... to show customer profile information like you have with Shopify. Real Time Chat - Allows us to answer questions in real time like sizing, shipping, etc... to increase conversions. highly customization options available for integrated intelligent adaption. Price for live chat is too high for me as a small business . one place access to direct online contact from potential customers. Interacting with clients with more control is something i always wanted. Its a good feature that you can adopt in . "Great customer messaging platform that works like a helpdesk and CRM." 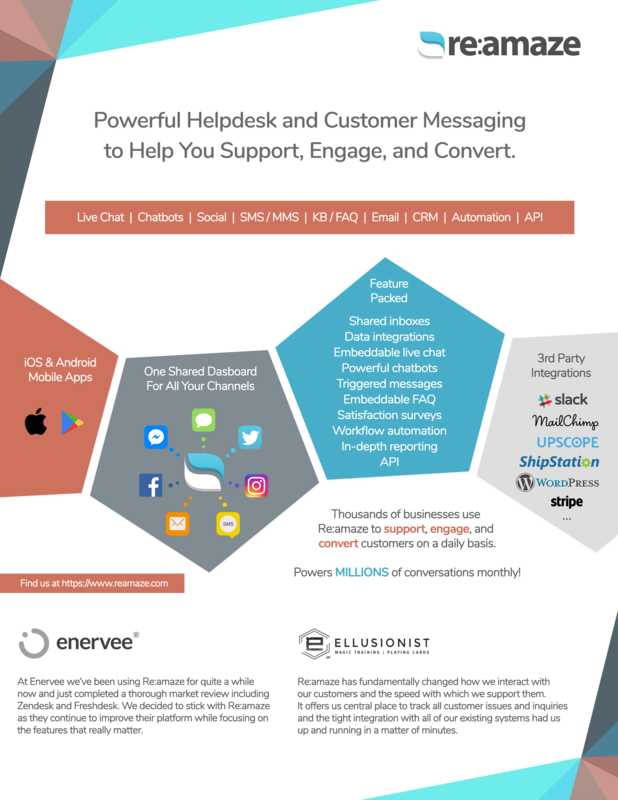 This is the perfect platform if you're looking for a hybrid helpdesk with CRM features, being abel to message customers automatically, and if you need a shared inbox. The features are well thought out and intuitive to use. Plenty of features with access controls for all my team. Works with all our stuff like email and social media. Not all of our staff members talk to customers but need to see stuff. Reamaze doesn't offer free seats or temporary seats. We started off paying for a few but they were kind enough to comp us those seats. Definitely give them a try. It's a great product. Customer service. Marketing automation. Some sales related efforts. "They live what they preach! " Super user friendly interface that makes it easy to connect to customer. They continue to improve the platform and they take your feedback seriously. Some of my request got implemented promptly. Reamaze has great API and connects to many platforms. Wish there was a 'favorite screen' for each user. My dashboard has a lot of menus, gets a bit overwhelming. Go for it, I highly recommend Reamaze. It pretty much works on any site. Put all channels of support on one platform. Chat, email, ecommerce and social media. "Re:amaze will help organize your team workflow and increase efficiency to free up time." Personal Accountability, as well as how smart the filter and email sorting is. It makes allocating responsibilities among the team easier and more efficient. How hard it is to forward, cc, do some normal email functions. I wish I could import my outlook contacts and have a personal email section of reamaze so that i could eliminate my use of outlook. I also wish the bolded emails were more bold. Emails stacking up. It's beneficial simply because it frees up time. I love being able to get back to customers all in one place! Instagram integration is a little annoying, as EVERY comment comes through as a new email. Would prefer if the thread didn't refresh upon every comment somehow. "Invaluable tool for managing queries!" We love that we can easily view everything at a glance, it tells our agents when a colleague is viewing an enquiry and the ability to create different channels makes breaking down enquiries via sales channel easy. Workflows feature and autoresponder are used often. Brilliant! Sometimes we have come across a bit of a bug where it doesn't resolve a query when clicked, sometimes on a batch of conversations or for a set time. Our agent then loses all their response and has to come back to reamaze in a few hours to check if working. Modern. attractive and functional and comes with every feature we need - our business couldn't manage without it! Single source for all staff to review all incoming communications. Cut our payroll costs for service in half and customers like it more too. Allows faster more efficient communication and cuts re-work as well. A great tool where teams handle a customer base. Not much to dislike...certainly would like to see integrations with even more incoming lines of communication (like posts on Youtube videos) but very useful as is. Would also like to see built in offers but may be feature I have not found yet. More built in automation would be nice, although it would come at the cost of a lot of deep customization. Try it out and see if it reduces staffing costs. Is free to try and pretty simple to set up. Worth a few hours to cut in half the time spent on servicing customers each week. Allows more co-ordination and less dropped customers and projects. The trial allows you to use all the features and decide which ones you want to subscribe to after the trial. Increased response speed and reduced staffing costs to do it. Has also stopped customers from getting 'lost' or forgotten when follow-up is required. Allows less people to do more work with greater accuracy and higher customer satisfaction. Makes complicated multi channel communications easy. "BEST CHAT/SUPPORT DESK APP FOR SHOPIFY"
We have used many chat apps over the years and since transitioning to Shopify we have been using Reamaze and could not be more satisfied. The product offering is phenomenal and they only continue to add to it. Their support and willingness to help could not be more appreciated. So impressed, look no further, we exhausted testing with nearly every other option out there. Enjoy REAMAZE! Shoutout to Lu and Martin for their continued top notch expertise and service. Quite honestly nothing comes to mind that we dislike. Features that weren't there we've requested and they have either been introduced or in the pipeline. They are very fast to add new features and extremely receptive. Streamlining our customer service and sales tickets in a robust omni channel platform. This makes our backend work extremely efficient. That a conversation can go from a chat with a client to an email and back again. Also that I can respond via a mobile device. Process of attaching files. I wish they showed inline with a conversation with the text that references the image. Providing customer support for our software product. We are better equipped to provide support no matter where we are with the mobile app. "Perfect Chat system for any size business"
The ease of access is our favorite quality. The system is very easy for everyone to use and understand. The only thing we dislike is our time available to really learn to utilize all functions. It is a great system for "Chat" with customers. It definitely has increased AOS for us. Customers who are on the fence about a product are able to communicate with us immediately. "The right mix of features at the right price"
Reamaze provides a lot of value for the price. There are a lot of vendors in the live web chat/support desk/knowledgebase space. Reamaze is set apart by its wide set of services (embeddable knowledgebase, live web chat, automated replies, social monitoring/multichannel support) at a solid price. They also have a mobile app so I (and other support reps) can quickly respond to support cases on-the-go. The knowledgebase editor is a bit old fashioned (only supports markdown and html). It would be better if the article editor offered standard rich text editing and uploading media assets (images/screenshots). Reamaze is great for tying in multi-brands, and multi-channels all-in-one. No needs for separate accounts, etc. Would like for Reamaze to track CallerID with AirCall so we know who left us a message and the voicemail is tied to the Customer Account in Reamaze. We own/manage multiple brand eCommerce companies and Reamaze is awesome for getting everything all in one place. "Super easy to use. Great customer service." Ability to see what customers are doing. There is no native translation feature so I have to translate everything myself but this is not a huge problem. Definitely try it out. Seems like a diamond in the rough. I originally tried Reamaze for customer support but found that it does a lot more than that. It can connect my email and social media profiles so I can chat with customers but it also has marketing features and can help me monitor customers. "Best Switch Ever From Gorgias!" I like how I can see live stream when customers are online, and what their typing during chat. It really comes in handy. Nothing really, I used many other companies till Reamaze, discontinued our plan with others, and this is by far the best. If we can have better chat looks, make it look more up to date. I would love to also have the notification sound on for Safari. It works from Chrome but not on Safari Apple. Better customer experience. Customers love the chat and how you can customize it to a certain way. "Engaging platform to solve client needs"
always accessible client experience not only on our website but on media platforms as well. Just works. Multichannel without thinking about it. Easy to use and get started with. No extensive setups required. And fills the needs we have to manage the support. We need to get support issues for pandacommerce. Hi There! Thanks for taking time of your day to leave us a review. We'll definitely look into PandaCommerce support and see what we have to work with from their API. As for being able to set a reminder without a timer, it certainly is an interesting idea. Is a Re:amaze version of a to-do list something you had in mind? Reminders in the context of customer support is to ensure you follow up with the customer in time. A to-do list might make sense in the future but it's not currently supported right now. I'll bring this up with the team to see what they think! Thanks again and we appreciate your continued support. "We found new customers almost instantly"
We don't have any complaints or dislikes at this time. We found new customers almost instantly. The easy to use, friendly chat gives customers incentive to send a quick message and start the conversation. "I really do love Re:amaze"
The clean lines and design is very simple to use compared to other platforms. We have used several other companies and they have not been as inclusive. I would like a program with costume skins or colors that can be adjusted. We help provide technical assistance as well as any other order questions a customer has. "Awesome platform for helpdesk and customer communications." Easy to use platform. Great pricing and packed full of useful features. Nothing really. The platform can use a touch of a UI update but the team is already working on that. KB needs some more customization options. Make sure to sign up for a demo of the platform. Customer engagement, cart abandonment, customer communications from multiple channels. I realized that automated workflows are a big help when it comes to prepping our support team. You are able to cutomize the setup to your specific case and needs. We have a number of small sites,, each having a specific support manager. Currently the pricing structure is more friendly if you are running few larger sites. Moving more support requests away from phone support, to email or chat based support. "Well developed business email client"
Remaze offer's organization and reports. Reports could download faster. When pulling a month's worth of emails, it takes a long time to load the download. If this could improve slightly, it'd be a real winner. improve the reporting process from downloads to organization. Technical, customer, and sales inquiries. Easy to use, can connect multiple social media accounts. It really tidens up the business. Nothing. Maybe interface can updated so it would look more good. It helped us to decrease number of calls we receive in a day. Now we can manage customers on chat more practically. * We monitor all Re:amaze reviews to prevent fraudulent reviews and keep review quality high. We do not post reviews by company employees or direct competitors. Validated reviews require the user to submit a screenshot of the product containing their user ID, in order to verify a user is an actual user of the product. Hi there! Are you looking to implement a solution like Re:amaze?